McCurley’s Floor Center commercial laminate flooring offers stylish and sophisticated laminate with the rich depth of color and texture of hardwood and stone from major manufacturer of laminate flooring include Alloc Laminate, Armstrong Laminate, Wilsonart Laminate, Shaw Laminate, Mohawk Laminate, Mannington Laminate, Quick Step Laminate and more. Our Commercial laminate features high pressure laminate designed to hold up in high traffic area and is easy maintenance. Laminate installation is fast and easy installation.MacFloor Commercial Laminate and Hardwood Floors and Installation has been proven the excellent standard for many major commercial projects. Whether your commercial project is a small remodeling or a large tenants improvement, or an Office Building, Schools, Library, Hospitals, Dental Offices, Department Stores, Airports, Computer Labs, Shopping Malls, Heath Clubs, Car Showrooms and others commercial spaces. We can larges you the largest selection of commercial flooring products and services at the lowest price. We are a full service commercial floor covering company with over 37 years of experience in flooring products & commercial flooring installation. We can insure you a pleasant & hassle free flooring experience with us.We offer several promotions and deals including Financing, regular sales on laminate floors, hardwood floors, carpet and carpet tile, commercial vinyl and VCT and free in-house / office estimates, free design consultation, and free delivery in most areas. Our Bay Area flooring warehouses carry a large amount of commercial product in stock for immediate delivery and installation, and our national distributor channels provide high-quality commercial flooring throughout the country. We look for carpet and flooring products which are environmentally friendly and have a low VOC count, and LEED certification eligibility and we are committed to partnerships with green and environmentally – responsible companies who maintain our natural resources. 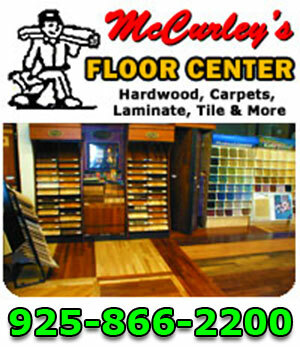 Come visit McCurley’s Floor Center Inc, today and choose the carpet and flooring that’s right for you! Our flooring stores in the San Francisco Bay Area, San Ramon and Concord, offer a huge selection of Commercial Flooring products in all beautiful styles, colors & design. We offer a professional flooring installation service. Many of big corporate names of America have used our Flooring products and Flooring installation service since 1973. 1) Pergo Commercial Laminate Flooring. 2) Shaw Commercial Laminate Commerce. 4) Quick Step Commercial Laminate. 5) Aloc Commercial Laminate Flooring. 7) Balterio Commercial Laminate Flooring. 8) BHK Commercial Laminate Flooring. Laminate Flooring is made of a four layers which are bonded together. The first layer is the wear layer. The Laminate Floor wear layer always is hard and durable. This layer also is static resistance. The top layer of the wear layer contains Aluminum Oxide and Melamine Resin. The Second layer of Laminate floor is Decorative layer: A decorative sheet area of Laminating fuses the wear layer and the decorative sheet on to the core material. The decorative area is a high resolution photo of wood floors, tile, or natural stone. Laminates 3rd layer: Is an area which is made of High Density Fiber Board. Some core areas may be made of Melamine products which help for moisture resistance. Whether Your Home Is In East Bay – West Bay – South Bay or North Bay McCurley’s Floor Center Can Help You To Choose A Right Flooring And Offer The Best Flooring Installation Services. 36 Years of Flooring Experience Can Make A Big Difference. The fourth layer of Laminate flooring is called backing layer. The backing area is made of Melamine plastic which holds the Laminate plank. It also plays a roll against moisture. Some of the Laminates have attached underlayment to the backing layer. All four layers of laminate are then combined by using Direct Pressure Laminate Process or High Pressure Laminate Processing. 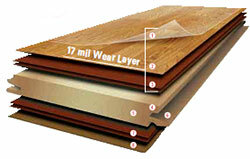 The assembly of layers of Laminate floor is started when all laminate layers are stacked on top of each other. Then the pressuring process will start. The stacked area will pressure the laminate between 300 to 500 pounds per square inch at approximately 400 degrees heat. After the cooling process, the boards are cut into planks floor or tile floor and the other process such as profiling and tongue and grooving the edges will start. DIREST PRESSURE LAMINATE FLOORINGDirect Pressure Laminating fuses the wear layer and decorative layer into the core material using pressure between 300 to 500 PSI. HIGH PRESSURE LAMINATE FLOORINGHigh Pressure Laminate flooring is manufactured at 1400 pound per square inch pressure. The Laminated area and high pressure backing are then bonded with high pressure to a water resistant HFD core. -High pressure Laminate Flooring wears better. -High Pressure Laminate does not scuff or scratch easily. -Laminate Flooring has a better impact resistance and does not dent when is high pressure. -Because High Pressure Laminates are harder it shows the pattern of Laminate Flooring better. -High Pressure Laminate installs easy and cleans better. During installation of the Laminate Flooring you do not notice a lot of chipped corners. The Flooring installers like working with High Pressure Laminates high-pressure laminate make you’re the laminate installation job go smoothly. Whether You’re Laminate Floor is for Home, office, retails space or a multi story building we have the laminate floors to fit your quality and budget and no matter you’re in East Bay – West Bay – South Bay or North Bay McCurley’s Floor Center Can Help You To Choose A Right Flooring And Offer The Best Flooring Installation Services. 36 Years of Flooring Experience Can Make A Big Difference.